Ania is just as exhausting as I remember Austen's Emma so Rao hit that mark perfectly. Actually maybe a little more because she had social media preoccupation & lived in a state of perpetually being accessorized appropriately just in case some random took a pic and posted on Instagram (she'll carry around an empty hatbox just to look "casually" perfectly accessorized). Admittedly, while I'm an Austen fan and always want to get my hands on retellings, Emma is not my favourite work. I'm a Persuasion and Anne devotee so based on personality and tone alone, Emma's disposition is, for me, a harder sell as anything remotely charming. But Rao reeled me in by vividly painting the landscape that is Dehli, the Khurana estate and environs and all of the others who populate these places and have to deal with Ania's breathtaking entitlement and machinations (the self-serving explanation of "check your privilege" she gives to her father was hilarious). There's rich detail expressed in landscape, furnishings, food and even the weather. It was witty, immersive and I was swept up in the entire story. I even admit to taking complete delight in Ania's spectacular failures of judgment. Couldn't happen to a more deserving meddler. There are also enough pieces that are a bit of a departure from Emma as a consequence of the modern setting that I think elevated the story and kept my interest. While in the end, Ania is mostly as she began, remaining ever "Emma" and to my mind, the case still isn't made as to why her "George" would fall for her, I don't hold it against the story as it's true to the original. If Austen didn't convince me, Rao need not. I did very much enjoy the trajectory of others but most especially of Nina. Hers was quite heartbreaking in the end and all the realizations she comes to while at the Royal Opera House will remain with me. It was one of my favourite parts of the story. With regard to wit and its clear look at the monied class and all its attendant conceits, obsessions and quirks, this definitely reminded me of Crazy Rich Asians. And I was actually a bit sad this is a standalone because I wouldn't mind checking in on many of these characters again, especially Ania (because growth is a thing and she's got plenty of room to grow). And I just loved both covers so much I had to post them both. I'd gladly read another from Rao and will be looking forward to it. Definitely recommended. Many thanks to the publisher for the Advanced Readers Copy. Summary: Beautiful, clever, and very slightly bored, Ania Khurana has Delhi wrapped around her finger. When Ania finds love for her spinster aunt, she realizes her potential as a force for good. For her next match, Ania sets her sights on Dimple: her newest, sweetest, and, sure, poorest friend. But her good intentions may be misdirected, and when her aunt's handsome new nephew arrives from America, the social tides in Delhi begin to shift. Surrounded by money old and new, navigating gossip, scheming, and an unforgettable cast of journalists, socialites, gurus, and heirs, Ania discovers that when you aim to please the human heart, things seldom go as planned. 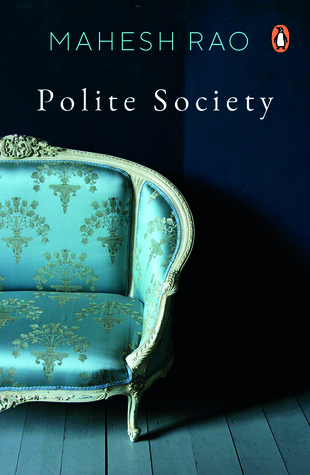 Using Jane Austen's Emma as a springboard, Polite Societytakes us into the lives of a group of characters we never want to part with. 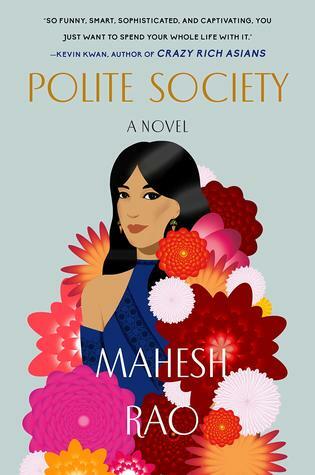 Pairing stiletto-sharp observation and social comedy with moments of true tenderness, this delicious romp through the mansions of India's elite celebrates that there's no one route to perfect happiness.